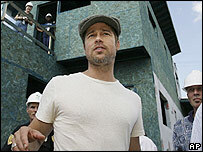 Hollywood star Brad Pitt has said the pace of rebuilding New Orleans is still too slow almost two years after Hurricane Katrina struck the city. The actor, who was in the city to launch an environmentally friendly new home in a poor neighbourhood, said he would "remain vocal" about the issue. "It's hard to find an overall victory when you see how slowly everything is still moving," the 43-year-old said. Pitt and partner Angelina Jolie bought a home in New Orleans in January. The couple own a mansion worth $3.5m (£1.8m) in the historic French Quarter. "We've got to push to get these levees taken care of and correct the engineering mistakes of the past and get these wetlands taken care of for this city," the star told reporters. Pitt said the rebuilding project he is supporting, carried out by Global Green USA, could encourage people to return to the city. The actor said Hurricane Katrina was a "man-made disaster"
"We knew we couldn't bring back the families and friends that were lost, bring back the heirlooms, the pictures," he said. "But maybe, in the process of rebuilding, we could build something smarter, and create a better way of life for those people who live here." Pitt said he, Jolie and their children would later tour the Holy Cross area privately. "There's so much of this culture here that is unlike any other city that we have," he said. "It's a feeling that I can't quite explain, but I love being a part of it."